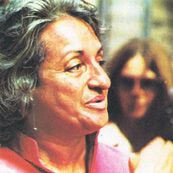 Betty Friedan has passed away. Writer of the Feminine Mystique, she is considered a foremother of the feminist movement and has been an inspiration to millions of women. With a book that has spanned 30 years as a staple of feminist lit, she is an inspiration and a reminder that the world can be changed by asking one single question (and being incredibly nosey whilst talking to old college buddies). I am not alone in saying that in high school I read this book and felt tre chic in doing so. I imagined myself in college, drinking coffee and debating the fine points of the feminist movement with my new gaggle of international girlfriends. Of course, adding this book to my mind’s library only truly served one single purpose: lighting a fire for my desire to learn and understand more about myself and the world that was available to me as an individual and as a woman. Betty: bless you for your curiousity, passion and down right individuality at a time when women were starting to realize that wanting to be more did not mean we were ever worth less. One look at our website and you will get the answer. Prestigedissertations.com has several abstracts that will assist you in judging our quality. With our highly experienced writers, you can be sure that we only offer the best. Not convinced? Just send us an email and we will send you our dissertations for free! !